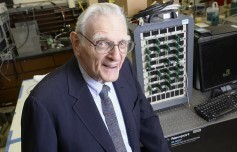 Goodenough, co-inventor of the original lithium battery technology, completed his research on the technology with Cockrell School senior research fellow, Maria Helena Braga. The newly developed battery is a low-cost, solid-state battery that is noncombustible and has a long cycle life with a high volumetric energy density and fast rates of charge and discharge. “Cost, safety, energy density, rates of charge and discharge and cycle life are critical. 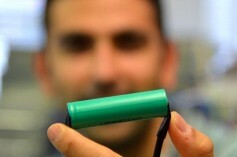 We believe our discovery solves many of the problems that are inherent in today’s batteries,” Goodenough said. The researchers demonstrated that their new battery cells have at least three times as much energy density as today’s lithium-ion batteries. The UT Austin battery formulation also allows for a greater number of charging and discharging cycles, which equates to longer-lasting batteries, as well as a faster rate of recharge (minutes rather than hours). 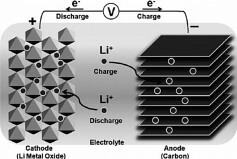 Today’s lithium-ion batteries use liquid electrolytes to transport the lithium ions between the anode (the negative side of the battery) and the cathode (the positive side of the battery). If a battery cell is charged too quickly, it can cause dendrites or “metal whiskers” to form and cross through the liquid electrolytes, causing a short circuit that can lead to explosions and fires. Instead of liquid electrolytes, the researchers rely on glass electrolytes that enable the use of an alkali-metal anode without the formation of dendrites. In experiments, the researchers’ cells have demonstrated more than 1,200 cycles with low cell resistance. Because the solid-glass electrolytes can operate — or have high conductivity — at -20 degrees Celsius, this type of battery could perform well in subzero degree weather. This is the first solid-state battery cell that can operate under 60 degree Celsius. 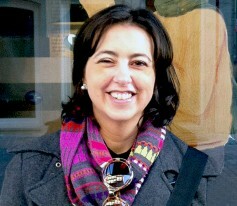 Braga began developing solid-glass electrolytes with colleagues while she was at the University of Porto in Portugal. About two years ago, she began collaborating with Goodenough and researcher, Andrew J. Murchison, at UT Austin. The engineers’ glass electrolytes allow them to plate and strip alkali metals on both the cathode and the anode side without dendrites, which simplifies battery cell fabrication. Another advantage is the battery cells can be made from earth-friendly materials. “The glass electrolytes allow for the substitution of low-cost sodium for lithium. Sodium is extracted from seawater that is widely available,” Braga said in an interview with the UT News, the University’s newspaper. Goodenough and Braga are continuing to advance their battery-related research and are working on several patents. In the short term, they hope to work with battery makers to develop and test their new materials. The battery research is supported by the University of Texas at Austin and there are no grants associated with the work. The UT Austin Office of Technology Commercialization is actively negotiating license agreements with multiple companies engaged in a variety of battery-related industry segments. Development of lithium-ion battery technology is intense. Samsung and MIT announced in 2015 a new material — a solid electrolyte — that could not only increase battery life, but also storage capacity and safety. Using solid-state electrolytes, they said, exploding batteries would be a thing of the past. Also, there is no degradation of batteries, which means they could last through hundreds of recharge cycles. Active competition has gone on for years because lithium-ion battery technology is so widely used today. Not only has it been adopted for production tools — including video cameras, LED lighting, audio equipment and field monitors — but for other devices, ranging from cell phones to electric vehicles. A breakthrough could be the Holy Grail for battery manufacturers.